Houston’s system of bayous and reservoirs was built to drain a tabletop-flat city prone to heavy rains. But its Depression-era design is no match for the stresses brought by explosive development and ever-wetter storms. Nearly any city would be overwhelmed by the more than 1.2 metres of rain that Hurricane Harvey has dumped since Friday, but Houston is unique in that it gets regular massive floods and has an inability to cope with them. This is the third 100-year-or-more type of flood in three years. Also, Houston’s Harris County has the loosest, least-regulated drainage policy and system in the entire country, Bedient said. Here’s how the system is supposed to work: The county that encompasses Houston has 2,500 miles of bayous and channels and more than 300 stormwater holding basins, which are designed to fill up during intense downpours and drain slowly as high waters recede. Water is supposed to flow west to east through bayous, which are tidal creeks that often have concrete improvements to make water flow and are connected to the Galveston Bay. When big rains come, officials also activate two normally dry reservoirs, closing the floodgates to collect the water and keep it from overwhelming the downtown area. But the main bayou through downtown Houston, Buffalo Bayou, “is pretty much still a dirt mud channel like you would have seen 100 years ago, just a little cleaned out,” said U.S. Geological Survey hydrologist Jeff East, who is based in Houston. And because the coastal plain is so flat, only sloping about 30 centimetres per mile, the water doesn’t flow out of the bayous fast, Bedient said. Also, some of the bayous, such as Brays, can only handle 10-year storms, he said. Harris County didn’t leave enough right-of-way space to expand its bayous, Bedient said. And widening projects have been slow and inadequate. Because of big early 20th-century floods, Houston designed two dry emergency reservoirs that are only activated in heavy rain, Addicks and Barker, both formed by earthen dams. Addicks is 18.8 kilometres with a maximum elevation of nearly 37 metres. Barker is 22 kilometres and has a maximum elevation of 34 metres. Normally the floodgates are open and the two areas are dry parkland with sports fields and biking paths. They were essentially dry on Aug. 25, the day Harvey struck, East said. By the middle of the next day, the floodgates were closed and water levels were starting to rise, East said. Now the reservoirs are overflowing. Officials are being forced to release some of the water pressing against the 70-year-old dams and backing up into wealthy subdivisions. But those releases could worsen the extreme flooding downstream in Houston. 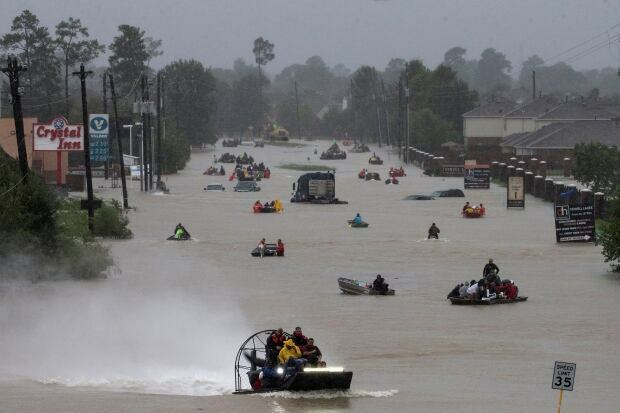 People evacuate a neighborhood inundated by floodwaters from Harvey on Monday, in Houston. More reservoirs are needed, Blackburn and Bedient said. Another reservoir had been planned for Houston’s western prairies, but development killed that, they said. Blackburn said studies show those prairies can absorb as much as 28 cm of rain per hour. But he said elected officials allowed subdivision after subdivision to expand outward. Houston’s storm drain and pipe system is minimal compared with that of other cities and at most can take four cm of rain, Bedient said. But mostly the problem comes down to helter-skelter development in a county with no zoning, leaving lots of concrete where water doesn’t drain, and little green space to absorb it, Bedient said. 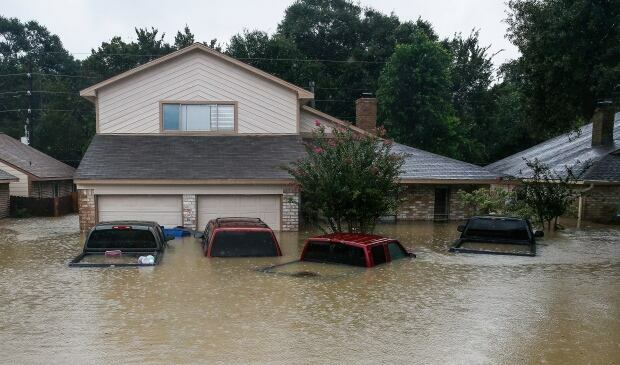 Local politicians are simply unwilling to insist in the local code that developers, who are among their biggest campaign donors, create no adverse effects, said Ed Browne, chairman of the non-profit Residents Against Flooding. “In general, developers run this city and whatever developers want they get,” Browne said. His group sued Houston last year in Federal Court, demanding more holding ponds and better drainage. There are also more people. 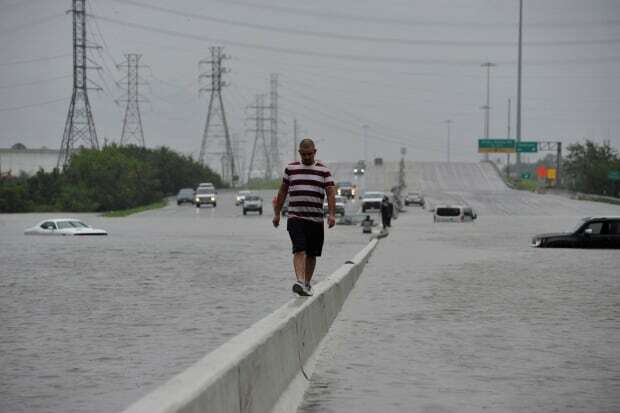 Since the previous record flood, inflicted by tropical storm Allison in 2001, Houston’s population has grown more than 23 per cent, said Sam Brody, a Texas A&M professor in Galveston who studies coastal flooding. 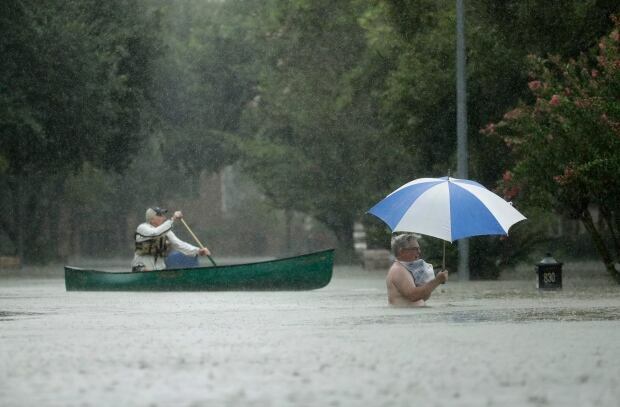 If that’s not bad enough, Houston is getting heavier rains with global warming because warmer air holds more water. Since 1986, extreme downpours — the type measured in double-digit inches — have occurred twice as often as in the previous 30 years, an Associated Press weather data analysis showed in 2016.